Welcome to the East Petersburg Library! Mrs. Brown will be available at the East Petersburg Library on cycle days 1, 3, 4, and 6. 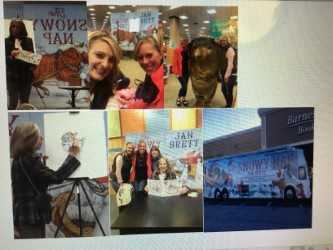 Mrs. Brown, Mrs. Heverling, and Miss Bushong met the famous author and illustrator, Jan Brett, and Hedgie on November 25th! Famous Author and Illustrator Jan Brett Visits Lancaster!